This is the finest two-component, room temperature cure, silicone molding rubber available. 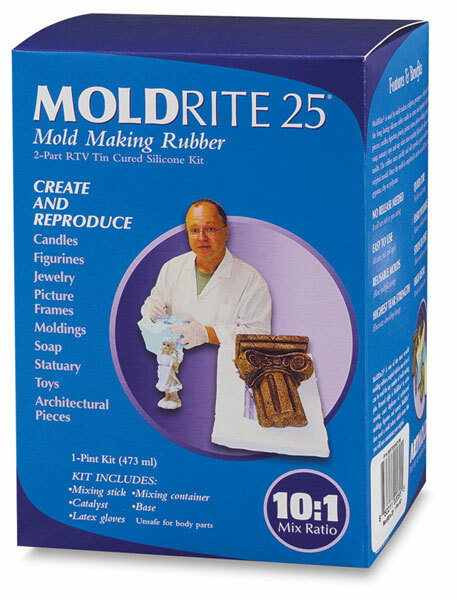 With higher tear strength and long mold life, MoldRite 25 is used for casting polyester, epoxy, polyurethane, masonry, gypsum, and wax with no release agents needed. MoldRite 25 is a tin-based silicone with a ten-to-one mix ratio frequently used with casting resins such as KastEZ Resin and low-melt metals. Kits contain a base (Part A), a catalyst (Part B), a mixing container, latex gloves, and a mixing stick. ® ArtMolds is a registered trademark.® MoldRite 25 is a registered trademark.